It's not a surprise that the release of Apple's new iPad would make a hot wave in the digital society. However, it still cannot overshadow other similar tablet products, becoming the only star on the digital market. Besides Apple's tablet computers, Asus Transformer Pad Infinity TF700T is another tablet computer worth mentioning. It is one of the best Android tablets made by Asus. It comes with a 10.1-inch touch screen with high resolution 1920-by-1200 pixels, plus 178-degree viewing angle, 32GB storage capability and 9.5 hours battery life. There is no doubt that it will also give us a stunning movie and video watching experience. If you happen to have a great collection of new DVD movies, it certainly is a good idea to play them on the tablet. Unfortunately, just as the world always lacks perfect things, Asus Transformer Pad Infinity TF700T is no exception. Even though it has many superb features for watching movies as mentioned above, it still has an Achilles' heel: no DVD player at all. In this case, would your dream of watching DVD movies on the andorid tablet come to naught? Take it easy. What you need is just an additional software program for ripping DVD movies to Asus friendly video files, namely H.264 or MPEG4. Here, MacX DVD Ripper Pro comes as an ideal Mac-based DVD to Transformer Pad Infinity ripper to solve your dilemma. With a new profile for Asus Pad Video, MacX DVD Ripper Pro can convert any DVD movies (encrypted DVD included) to Transformer Pad Infinity TF700T as well as other Asus devices, including Asus Nexus 7, Eee Pad Transformer TF101 and Eee Pad Transformer TF300 through a few clicks. In addition, this program also acts as a professional DVD backup software to help you copy DVD movies to your computer so that you will not need to spend time cleaning the DVD discs or protecting them from damage, loss or scratch as before. Rip homemade & copy protected DVDs to Asus Transformer Pad Infinity TF700T with unchanged movie quality speedily. Before ripping DVD movies to Transformer Pad Infinity TF700T, you need to download DVD Ripper Mac version, or click to download Windows version first. Insert the DVD disc into the disc drive, click the "DVD Disc" button to import it. If the new movie DVD releases is saved as a folder on your computer, you need to click the "DVD folder" button to locate that folder; or "DVD ISO" to import DVD from DVD folder saved on your computer. Step 2: Choose Output Video Format. To convert DVD to Transformer Pad Infinity TF700T, click along the route "to Asus Pad Video-Transformer Pad Infinity TF700T (H.264/MPEG4)" as the output format. After finishing the above steps, click the "RUN" button to start converting DVD to Transformer Pad Infinity TF700T. All the tasks will be finished in a short time, and then you can watch the DVD movies on Transformer Pad Infinity TF700T for fun. 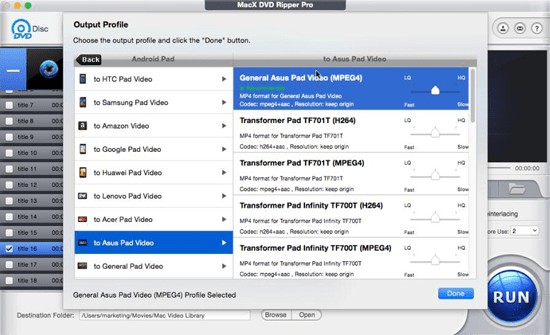 MacX DVD Ripper Pro also works as a flexible all-in-one DVD ripper for Mac to convert DVD to AVI, FLV, MOV, MKV, iTunes, iMovie, iPhone, iPad, iPod, etc. To playback DVD movie on iPhone iPad iPod, you can use MacX MediaTrans to move the converted DVD content to iDevices easily. This article will show you how to convert DVD to Google Nexus on Mac with MacX DVD Ripper Pro. Just a few clicks, you can enjoy your favorite DVD movies on Google Nexus 7 at will. Wanna rip DVD to android tablet on Mac? This tutorial can best remove your annoyance for it introduces you an easy solution to convert DVD to your gadget with a professional DVD to android tablet ripper. This tutorial easily guides you rip DVD to Acer Iconia tab supported MP4 video format with professional DVD to Acer Iconia ripper on Mac. Regardless of all protected DVD you own, you are permitted to watch any DVD movie on Acer Iconia A200 A210 A510 A700 conveniently. Notice: We only advocate using this best DVD ripper to rip commercial DVDs to Asus Transformer Pad Infinity under the concept of Fair Use and do not encourage any illegal reproduction or distribution of copyrighted content. Please abide by the local DVD copyright law before doing it.